Prospective homebuyers search out their potential new home in a myriad of online ways today – if they know your brand they may go directly to your website. But chances are, with 90% of buyers beginning their search via the Internet, they are also clicking on several online directories and listing services. 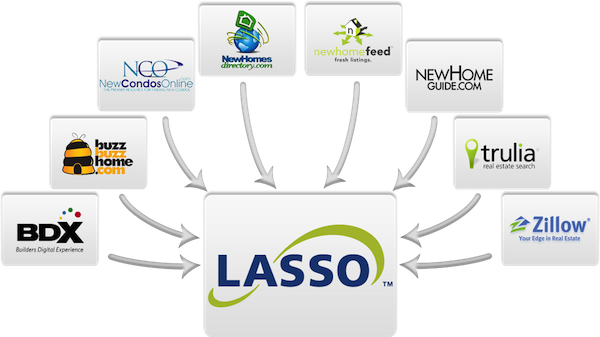 That’s why Lasso wants to make sure we can capture every lead for you, from anywhere, anytime. With instant notification to your sales counselors and agents, so relationship building and their follow-up can begin in moments from the time the consumer expresses an interest in your communities. We are proud to work with North America’s leading new home listing services – so you never lose another lead and sell more. Faster. Easier. It’s part of our commitment to be the front-runner in the building industry in lead management and CRM software.